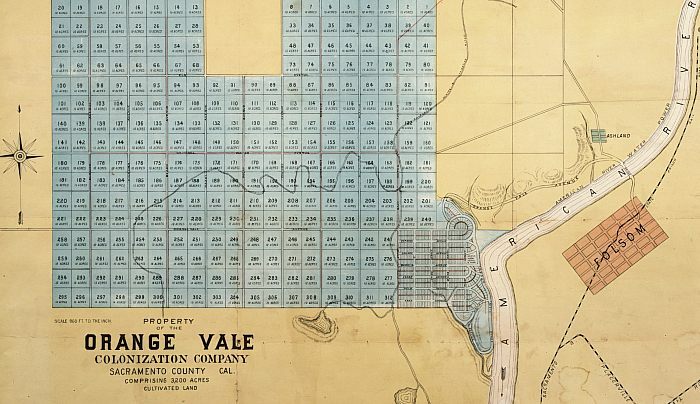 This advertising map of Orangevale is located at the Sacramento History On-line website. You'll need the Adobe Acrobat Reader to view the larger picture. Orangevale Colony was laid out in 10 acre plots which were considered just right for subsistance farming and a profitable orchard. A curiosity on this map is the planned City of Orangevale located at the bend in the American River. The developers envisioned a thriving business community centered on a luxerious hotel, but this concept never developed, and the area is now residential. The road exiting the Colony to the left under the compass is labeled Orangevale Road but is actually Greenback Road - just another developer's effort to promote the Orangevale Colony. Greenback Road was built after the Civil War and the landowners were paid in Greenbacks, the Federal currency at the time.